“Little” Kentucky Derby Festival: A Bluegrass and Lexington School Tradition. 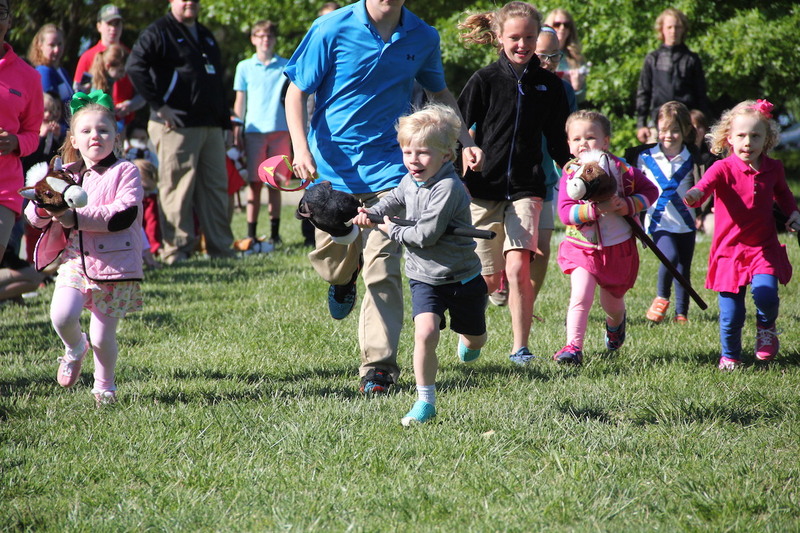 Did you know that in this year’s 143rd Kentucky Derby, over half of the runners were in some way connected with Lexington School families? That’s over half the horses in the big race. And that’s the way it is year after year because The Lexington School has a deep tradition of families who work and live in the thoroughbred racing industry. In fact, Founder Josephine Abercrombie’s Pin Oak Stud is a literal start to the symbolism and tradition of The Lexington School. Take the pin oak leaves in our logo, the Colt our mascot, and the Little Kentucky Derby: symbols of the deep roots in one of the most important economic and historical aspects of the Bluegrass. It’s no wonder the The Lexington School puts on its own Little Kentucky Derby Festival each year; it’s a fun, spirited tradition that’s run along for 38 years. This year, with a post time of 9:00 A.M. preschool students, assisted by their middle school trainers, lined up in the parking lot of the lower school building, big wheel mounts chosen, personalized, decorated helmets strapped to their little heads. Excited, nervous energy permeates the piggy back rides and hand-holding. They skip and prance as they prep for their big race. Running for the Roses Lexington School style means over 20 heats of farm “sponsored” big wheel and stick horse races where big and little buddies work together to cross that finish line as fast as they can while parents and TLS friends cheer from the “stands.” Overblown, hand-made signs and custom-made derby hats of Styrofoam and construction paper are the norm. Loud cheers for the runners is the norm too. This special derby tradition used to stand alone, but now it lasts all day long. Doors open at 8 AM with the kick-off to CELEBRATION, the school’s spring fundraiser, where breakfast and shopping the silent auction are the activity of the moment. Next, the post parade. No one wants to miss the singing of “My Old Kentucky Home,” so parents line the sidewalks early, cameras in hand, heads stretching up tall to catch a glimpse of their favorite riders. And we are off to the races but that’s just the start of a fun-filled, action-packed day of games and festivities. Green and Gray day is a field day of sorts, where the entire school 1st through 8th grades is divided into two multi-aged teams “Green” and “Gray.” These teams compete in a variety of games traditional to field day (sack races, egg relays, tug of war) to backyard games like Capture the Flag and Kickball. School spirit and camaraderie is tangible as older and younger kids join forces in this day of lightweight competition. After lunch the “best day ever” ends with Carnival. Middle School advisor groups imagine and design their own, sometimes inane, games for the younger kids, and fun activities include face painting, pie throwing, and water gun fights. No prizes needed…bragging rights is enough! Throughout the Little Kentucky Derby day, buddy teams can be seen together as the older students encourage and motivate their young jockeys and friends to do their best and to enjoy the race and fun festivities. A school-wide community builder that reaches everyone in different ways, it is a big day that honors Kentucky and Lexington School tradition. It is a day all students and parents cherish and remember for years to come.